During the very fecund Weimar period, four directors towered above the rest. Ernst Lubitsch, who had established himself with historical spectacles and witty romances, was the first to leave Germany after being wooed by Hollywood in the wake of his epic The Loves of Pharoah (1922). He went on to be one of the great directors of American comedy. F.W. Murnau, the great poet of German silent cinema, followed five years later, but barely had time to establish himself in Hollywood before his untimely death in a car crash in 1931. Fritz Lang, the master of pulp epics, made the biggest and most successful movies in Germany before getting out in 1933 when the Nazis took power, going on to the longest and most diverse career of the German emigres in Hollywood. All three of these, despite some critical ups and downs, have retained secure reputations, with their bodies of work standing as some of the most important in the history of the medium. The fourth great figure to emerge from German production in the ’20s, however, foundered after a remarkable string of powerful and influential movies. More of a realist than the others, and influenced by his Leftist beliefs, Georg Wilhelm Pabst made films which dissected issues of class and gender which underlay German society in the post-war years – The Joyless Street (1925), The Love of Jeanne Ney (1927), and the two films which made Louise Brooks an icon, Pandora’s Box and Diary of a Young Girl (both 1929). Each of these films views the economic problems following the war through the experiences of women struggling to live in a society which abuses and exploits them. But with the coming of sound, in addition to his adaptation of Bertolt Brecht and Kurt Weill’s Die Dreigroschenoper (1931), Pabst made a pair of male-centred movies which directly addressed the effects of World War One and its aftermath on masculine identity … his last great films before an abortive move to Hollywood (just one unsuccessful feature in 1934), and a retreat first to France and then to his native Austria just before the Anschluss. Trapped in the Nazi sphere, he ended up making movies for the regime – Komödianten (1941), Paracelsus (1943) and Der Fall Molander (1945). Although his reasons were apparently never clear, this was seen as an act of betrayal by opponents of the Nazis; not only were his post-war films poorly received by critics, the reputation of his earlier work suffered in retrospect. His best-known film remains Pandora’s Box, but that has as much to do with the image of Louise Brooks as it does with Pabst’s mastery of the medium. His first post-war film was Der Prozeß (1948), an explicit condemnation of anti-Semitism which failed to convince his critics to revise their negative opinion of his apparent collaboration with the Nazis. The major silent films, plus the Brecht adaptation, have been available on disks of variable (and frequently problematic) quality for some time, with only Diary of a Lost Girl released on Blu-ray until the recent Masters of Cinema three-disk, dual-format edition of Westfront 1918 (1930) and Kameradschaft (1931). 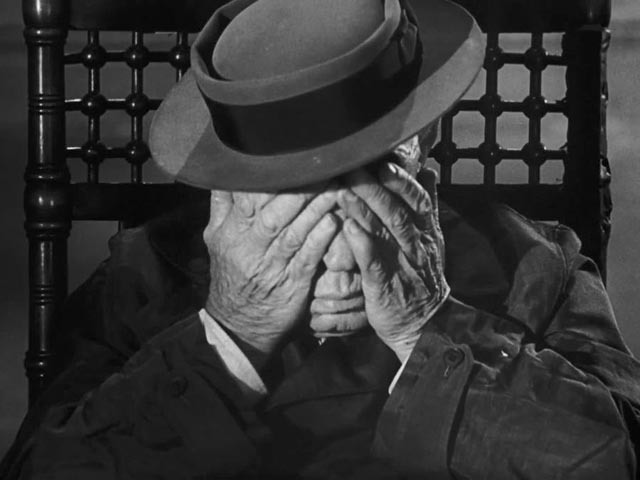 Despite some source issues (the opening titles of Kameradschaft and an insert of a newspaper late in the film are missing from the print), the overall technical quality of both films is impressive … which is all the more notable because the photography of both is at times quite radical in its use of darkness. Given what was to come ten years later, it’s ironic that Westfront 1918 and Kameradschaft were condemned and suppressed by the Nazis for their obvious Communist sympathies. The first film is a harsh depiction of the pointless violence of war as experienced by four men in the trenches late in the conflict. It was criticized for saying nothing about the causes of the war, the political context, but that was obviously never the intention. Like many anti-war films, the focus is on the immediate experience of individuals for whom life has been reduced to a moment-by-moment concern with survival. For them, the reasons for the war have become irrelevant. Their existence is focused only on the camaraderie they share with one another, a mutual emotional support which is all they have to fend off the terror of life at the front. 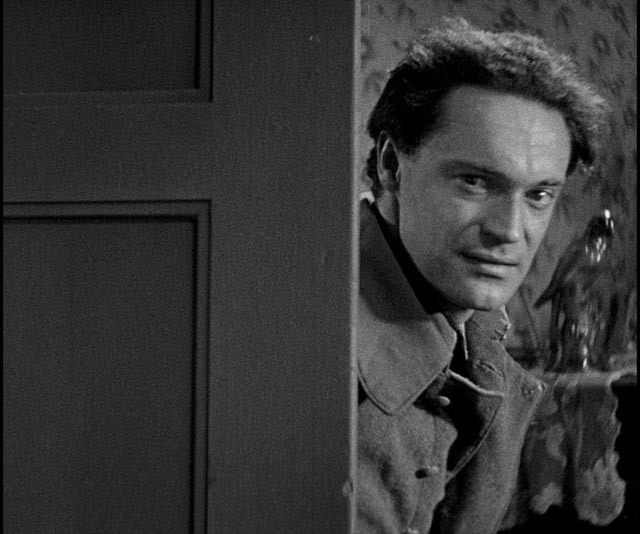 The unimportance of reasons is established in the first scene, in which these men enjoy a brief respite in a French farmhouse, joking with an old man and a young woman, Yvette (Jackie Monnier), with whom the youngest of the soldiers – the Student (Hans-Joachim Möbis) – briefly has a relationship. This impromptu party is interrupted by shelling and they all take shelter in the cellar. Who is doing the shelling isn’t mentioned, but later, back in the trenches, the Germans are hit by their own guns and almost buried alive. The man who emerges as the most prominent character is Karl (Gustav Diessl) and his brief furlough back in Berlin provides the only real break from the relentless threat of injury or death in the trenches. But even here there is little relief. When he arrives home unannounced – having passed a long line of people desperately hoping to obtain food from a store which quickly runs out – he finds his wife (Hanna Hoessrich) in bed with the butcher from downstairs; in order to survive, she trades sexual favours for scraps of meat. This sequence proves the strongest in the film, rife with moral ambiguities and conflicted emotions. Karl has been clinging to an image of his wife back home to anchor himself amidst the chaos at the front, and that emotional tie is now shattered, filling him with hopelessness. There is no comfort or stability here to counter the experience of war – the home front is desperate and suffering too – and he can’t wait to get back to his comrades, his friendship with those men replacing the fantasy of a patient faithful wife as his main reason to carry on. But back at the front, he learns that the Student is dead and soon a big attack leaves his other friend, the Bavarian (Fritz Kampers) dead, the young lieutenant (Claus Clausens) hopelessly mad, and Karl himself dying. War has stripped everything away and deprives even death of any meaning. (No sign here of the poetic irony of the final images of Lewis Milestone’s All Quiet on the Western Front, made the previous year.) It was this nihilistic view of the senseless waste of war and the dissolution of social connections back home that offended the Nazis, for whom sacrifice and bloody death were the essence of existence. In Westfront 1918, his first talkie, Pabst shows an impressive grasp of the new technology (although the track on the disk is in poor condition), mixing dialogue with gunfire and explosions, and even the clattering sound of dirt and shrapnel falling in the trenches. More impressive is the photography of Fritz Arno Wagner (who had worked previously with Pabst on Jeanne Ney and Diary of a Lost Girl, as well as with Lang and Murnau, among others) and Charles Métain, much of it shot at night with minimal lighting. Pabst had his crew develop a blimp for the camera so that it didn’t have to be locked down inside a soundproof booth, giving him the kind of mobility he was used to in his silent films. His tracking shots among the trenches and across the battlefield presage Kubrick’s fluid camerawork twenty-six years later in Paths of Glory (1957). The impressionistic glimpses we get of the battles add to the sense of disorientation felt by the soldiers, the reduction of life to barely comprehensible moments of violence and fear. 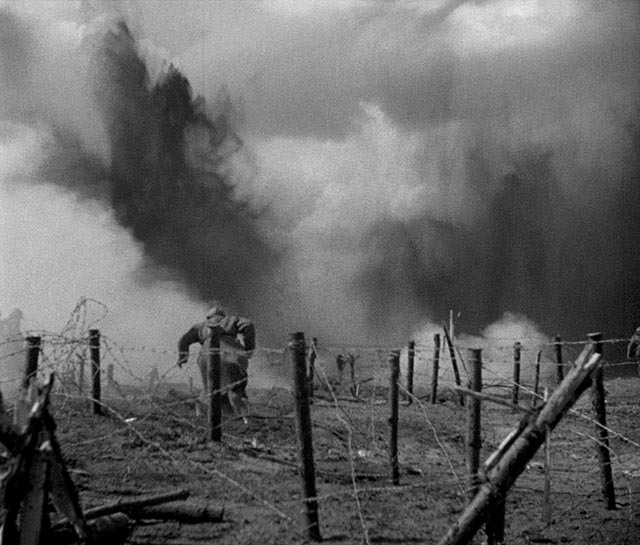 Westfront 1918 is a more visceral experience than All Quiet on the Western Front because it has been stripped of all the literary trappings which give the Hollywood movie (as good as it is) a kind of respectable distance from the raw brutality of the war. 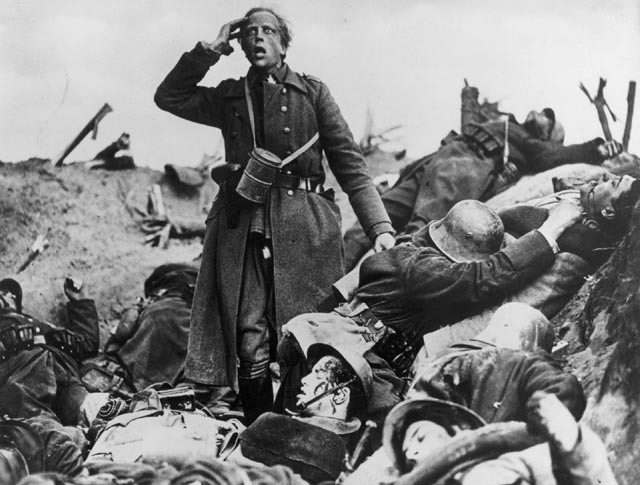 If Westfront 1918 depicts the utterly futile waste of war, Kameradschaft posits a solution. While it can and has been accused of naivety, there’s no denying that it makes its case with great dramatic conviction. Based on an actual incident from 1905 but transposed to the years immediately following the war, the film depicts a coal mining disaster in which hundreds of French miners are trapped by a fire and explosion in a mine which straddles the French-German border. Despite deeply rooted resentment and animosity lingering from the war, a German miner argues first with his co-workers and then with management that a shared identity as miners transcends national differences and he leads a group of rescue workers across the border to aid in the efforts to save the trapped Frenchmen. The film concentrates on the physical details of that effort, emphasizing the danger and claustrophobia faced underground. 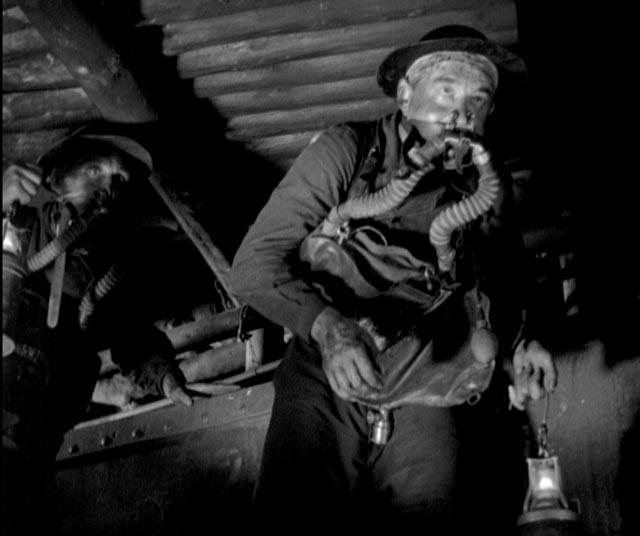 Although the above-ground scenes were shot on location in an actual mining community, the underground sequences were shot on remarkably convincing studio sets designed by Ernö Metzner and Karl Vollbrecht. Once again Fritz Arno Wagner (working here with Robert Baberske) creates an intense atmosphere through a daring use of darkness. Pabst and his crew give a visceral sense of reality to the nightmarish situation, slipping into overt Expressionism only once when a panicked French miner, seeing a German rescue worker approaching him, suffers a traumatic flashback to the war and tries to kill the man who has come to save him. 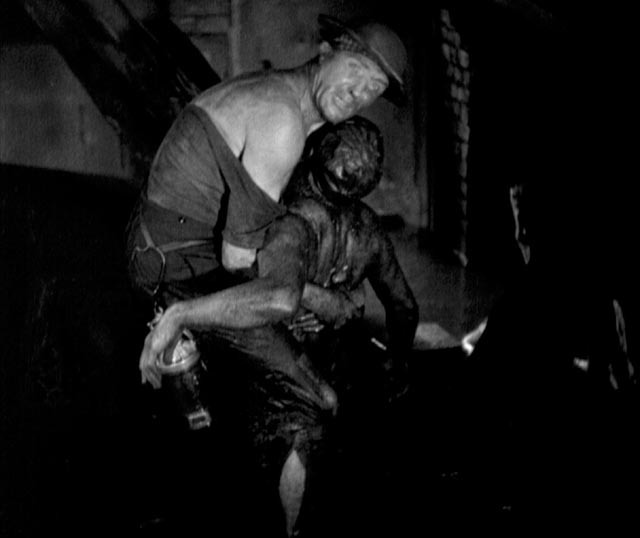 Through a series of vignettes depicting death, injury and salvation, the film erases all the festering national differences to create a sense of unity and shared purpose among the miners, leading to a final assertion of an international identity which binds all workers more strongly than any connections to national politics which strive to separate them for purposes of economic exploitation. There are many details which represent the obstacles placed in the way of this unity from the brief moment in which the German mine boss, having been pressed by his employees to allow them to make the rescue effort, takes credit for the idea of sending assistance to the French; to the crossing of the border with its echoes of the recent invasion as the German trucks speed past the French guards who raise their guns to shoot, stopped only by a timely call explaining the men’s mission; to the use of both languages and the inability of each side to make itself clearly understood by the other. (In its original release, the film was shown without subtitles so that audiences would experience the same incomprehension as the miners.) 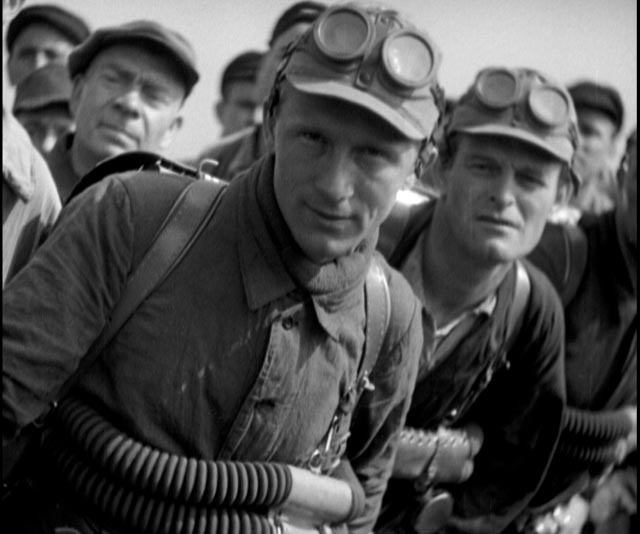 This theme of the difficulty of overcoming national and class differences climaxes with the scene of the hallucinating French miner; after this the common bonds shared by the workers take precedence, promising a better future … a promise which now looks hopelessly naive in light of the rise of murderous national dictatorships which were already forming even as the film was being made. The Masters of Cinema release of these two films gives them both superb visual presentations, with each film accompanied by an informative introduction by film scholar Jan-Christopher Horak, while Philip Kemp’s essay in the accompanying booklet details Pabst’s problematic career and the important place these films hold in his body of work. This release is one of the year’s most important in terms of both film history and the intrinsic cinematic value of the two films themselves. 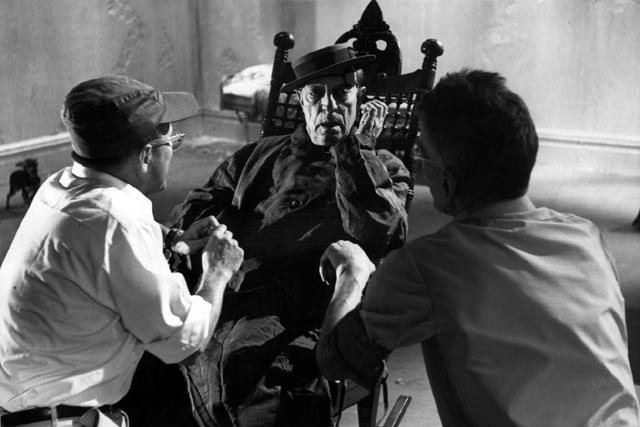 You couldn’t get much farther away from Pabst’s politically-driven realism than Samuel Beckett’s sole foray into movie-making, a twenty-two minute short (directed by Alan Schneider) starring seventy-year-old Buster Keaton in one of his last roles. If you can call it a role. In Film, Keaton is O (for Object), a figure first seen scurrying along a desolate street trying to avoid being seen by E (for Eye, the camera); he disappears into a tenement where E follows him relentlessly. 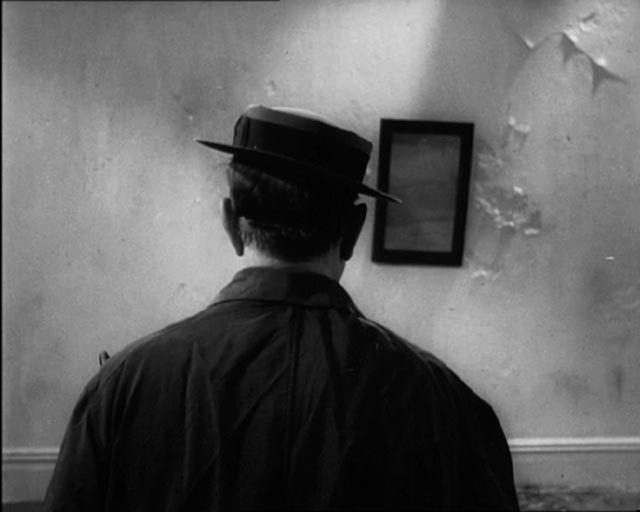 Circling a stark apartment, covering a mirror on the wall and futilely trying to eject a cat and a dog which insist on staring at him, O seeks a kind of existential anonymity which ultimately proves impossible because he can’t finally evade an awareness of himself. Simply being is a nightmare. Conceived by Beckett as an intellectual deconstruction of cinema, of the voyeuristic relationship between camera and subject, shot in lustrous black-and-white by Boris Kaufman, Film is a mysterious, obsessive, and perverse exercise which is at once intensely cinematic yet in a sense a conceptual failure. The visual and material nature of film works against Beckett’s austere intentions; his ideas may make sense in the abstract, but the physical presence of Keaton in sharply observed physical spaces denies abstraction. 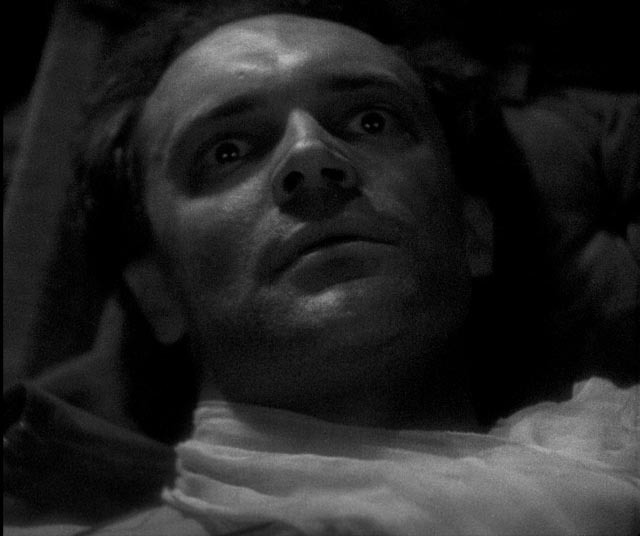 And most perversely of all, having cast a performer whose face is a key element of his art, the entire trajectory of the film is predicated on O desperately averting that face from the camera’s eye, until the final moment in which O finally confronts himself in a moment of horror. The final impression with which the viewer is left is one of a beautiful, mysterious, yet ultimately obscure ritual … perhaps after all not inappropriate in the overall context of Beckett’s work. The reason this obscure oddity has resurfaced now is that Ross Lipman, a film restorationist and essayist, has made a documentary – or Kino-Essay as he calls it – about the making of Film. Notfilm, produced by Milestone Films and written, directed, photographed, edited and narrated by Lipman, is a sprawling work (it runs almost six times as long as Film) and covers not only the history of the production itself but also the lives of the key figures involved – Beckett; director Schneider, who was a vitally important contributor to the American theatrical success of Beckett’s plays; producer Barney Rosset, whose Grove Press published Beckett’s work in the States; cinematographer Boris Kaufman, brother of Dziga Vertov and an Oscar-winner for shooting On the Waterfront; and of course Keaton, whose career had long since faded and who, according to Lipman’s account, didn’t have a clue what Film was about. But while it’s packed with fascinating material (including voice recordings of production meetings in which we can hear Beckett discussing his ideas with Schneider and Rosset), I found Notfilm very frustrating. Lipman is trying not simply to tell the strange story of the production, but also to meditate on the nature of cinema itself. He fills it with montages of images from early film which quickly become a distraction and, for me at least, fail to give up any clear meaning. Notfilm is the antithesis of the spare, stripped-down precision which characterizes Beckett’s work; it instead too often feels clogged and unfocused … and yet the story it tells is fascinating and that central narrative kept me watching despite my irritation. Milestone has released Film and Notfilm on two separate Blu-rays, while the BFI has released a three-disk dual format edition containing both. I opted for the latter because it was cheaper and contains all the directly related extras from the Milestone edition. The only differences are Milestone’s inclusion of a 1961 television production of Waiting for Godot directed by Schneider and the BFI’s inclusion of a 1979 British production of Film, directed by David Rayner Clark and starring Max Wall as O. Although interesting, particularly with the inclusion of the script’s opening sequence which was scrapped in 1965 because of camera problems, this alternate version of Film somehow lacks the original’s intensity. The shared extras include a reconstruction of that missing sequence, some outtakes with the cat and dog, excerpts of the audio recordings of Beckett, and additional interviews – with actor James Karen, a friend of Keaton’s; Jean Schneider, Alan Schneider’s widow; Beckett scholar James Knowlson; Jeanette Seaver, a friend of Beckett’s; and photographers I.C. Rapoport and Steve Schapiro, who photographed Beckett on the set during the production. There’s also a gallery of stills and a booklet with writing by Lipman, Michael Brooke and Vic Pratt. This entry was posted in Commentary, Review and tagged Actors, Blu-Ray, Classics, Directors, Restored Films, War Films. Bookmark the permalink.